This week's topic is about taking a long, hard look inside myself. I know that sounds deep and mysterious, but blogging is personal and takes a lot of self reflection about what content I share with the world. This is one of the biggest things I did when I decided I wanted to start taking blogging seriously. For as long as I can remember I've had the Bloggers Get Social website in my bookmarks. I don't know how or when I came across it, but I'm so glad I did. I loved the free ebook and it definitely molded the way I think about blogging. I won't into great detail about it (because I hope you'll check it out! ), but it helped me narrow down my blog focus, explained content calendars, and so much more. I owe so much of my appreciation to the owners of that site because their advice has helped mold this blog. They put everything into perspective for me: Why do I want to blog? Who do I want my readers to be? What do I want to share with my readers aka the world? What are your blog goals? 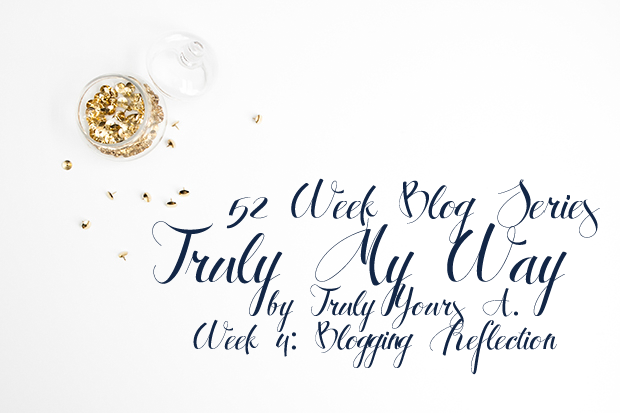 When I tried blogging the first time I didn't have any goals in mind and blogging just seemed like a way to waste time. Now that I have a purpose or something to strive for blogging is more fun for me. I see it as a form of expression, a way to break out of my shell and meet new people, or even a way for people to get to know the real me. I read so many great blogs and now I want to be a part of that.